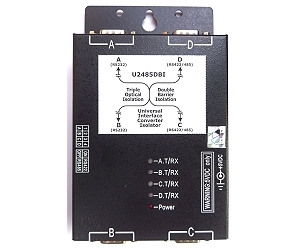 Universal RS232 or RS422/RS485 to Ground Isolated RS232 or RS422/485 Isolator & Converter. ★ Port A(RS232) to Port B(RS232) GROUND isolator. ★ Port A(RS232) to Port C(RS422/RS485) interface converter. ★ Port D(RS422/RS485) to Port C(RS422/RS485) repeater or Bridge. ★ Double Barrier Isolated Feature between input and output connector. ★ Triple way Isolation to break any Ground loop and stray current.